Sebastian writes: In addition to individual gig reviews (see links below), a separate feature (forthcoming) about the significant UK presence at the festival... and photos of the Canada Day spectacular (LINK), here is a round-up with brief notes on gigs I attended in the first few days. The sheer scale, the range of things here is such that a writer can only possibly see a tiny fraction of what is on offer. What was impressive about this set was the contrast of extremes. I found Ambrose Akinmusire at his most persuasive in the tender lyrical moments, when his ability to shape and caress a phrase with ineffable gentleness and delicacy is something few can match. 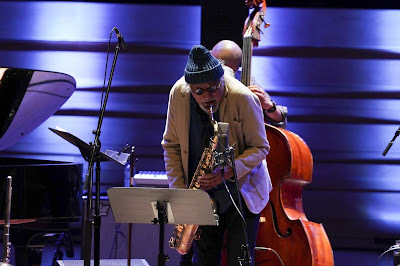 His quartet, and notably pianist Sam Harris, pull the focus in the opposite direction, stacking up the layers of the music harmonically, building the intensity in an uncompromising way. Harris has a chocks-away, Don Pullen way of attacking the music. This was one one which difficult-to-please folk in the press room were still talking about with delight on Sunday. Lloyd's allusive, weightless, playing was at its very finest, and he and the group were visibly taking each other to new heights throughout. 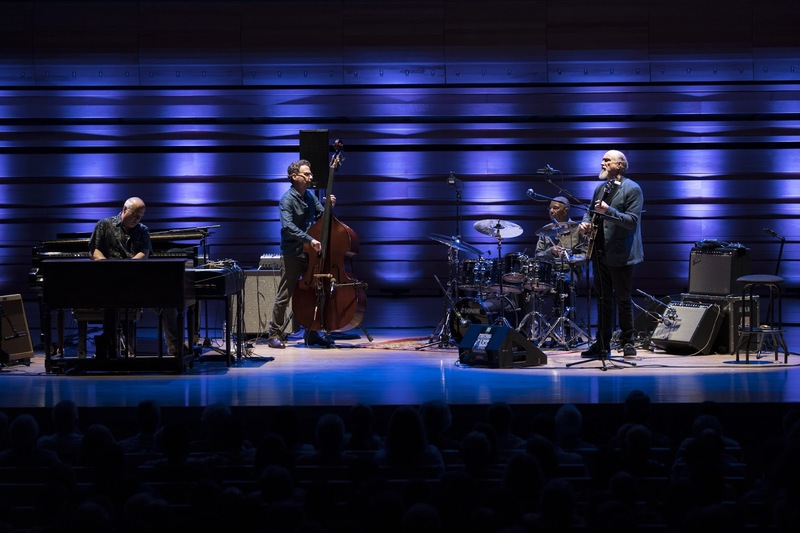 The supergroup of Jack DeJohnette, John Scofield, John Medeski and Larry Grenadier presented a set themed around the area they all live, and the heritage of Woodstock. DeJohnette had said earlier in the day when receiving the Miles Davis award: “I’m a colourist really. My playing is freely flowing, liquid." - exactly the quality Roger Farbey alluded to in a recent review. In the performance he also sang. An interesting project. Montreal-based singer Andrea Lindsay is making a name as an interpreter of French chanson but - as she keeps repeating apologetically - her first language is English. She has a light, France Gall-ish kind of a voice, and the persona of the ingenue. Music director was Mike Rud, a good friend of this site. Lindsay performed two Brubeck/ Nougaro numbers with Philippe Noireaut, a fine Montreal-based pianist associated with the late Toulousain genius songwriter. Her coup de grace was a pair of Boris Vian songs, notably On n'est pas là pour se faire engueuler performed with buzzing theatricality and instinctive comic timing. Merveilleux! Every seat was taken for the pairing of Bill Frisell and Thomas Morgan at Gesu. The wonderfully sensitive mutual listening and the contrast of Frisell's panoply of effects contrasted with Morgan's infinitely sensitive, melodic, conversational playing - with no electronics at all - should have been the whole story... but there was an incident: At the beginning of the Goldfinger theme, which would then later build into the theme from You Only Live Twice, Frisell managed to unplug himself with a clumsy foot trying to reach a pedal... and he uttered his very first words of the gig. Those words were: "That was the big f****** climax of the whole piece and I pulled out." Journalist Michael Bourne of Downbeat received the Bruce Lundvall award. Michael Bourne declared a strong and vital attachmment to this festival, to its breadth of music. He also recalled Dave Brubeck’s love of the festival and the very special audience. Tony Bennett had once told Bourne that the way the festival team always welcomed him had enabled him to give of his best. Bourne also recalled particular concerts. He remembered first hearing Diana Krall here in a small venue, and was so bowled over by the swinging energy of the music that he had recommended to Tommy LiPuma that he should record her Nat King Cole tribute. He also remembered last year's outdoor Jamie Cullum show in the Place des Festivals: “one of the best concerts ever”.